Which climate effects do clouds have? Under what conditions do they warm or cool the atmosphere? After more than five years of preparation, the specially equipped research aircraft HALO (High Altitude and Long Range Research Aircraft) took off for its first measurement flight in atmospheric research on 10th of December 2013. Prof. Bjorn Stevens and Dr. Lutz Hirsch from the Max Planck Institute for Meteorology (MPI-M) left Oberpfaffenhofen in Germany for a ten-hour flight to Barbados. 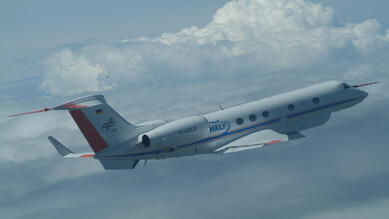 They operated numerous measuring instruments on board HALO on behalf of the German atmospheric research, technically supported by Friedhelm Jansen (also from MPI-M). It was the first major mission to exploit the novel capabilities of HALO to measure vertical profiles of all components of atmospheric water - like vapor, liquid and ice, in both cloud and precipitation forms, as well as the aerosol particles upon which cloud droplets form - from a high altitude. This started a new era of airborne atmospheric research. The aircraft, equipped with a large amount of advanced technology, is an initiative by German climate and environmental research institutions (see below) and is operated by the German Aerospace Center (DLR). The flights are part of the NARVAL project (Next-generation Aircraft Remote-Sensing for Validation Studies) and will provide the scientists with more detailed information on the constitution of tropical clouds (Fig. 1). The transatlantic flights from Oberpfaffenhofen to Barbados will complement the stationary measurements of the cloud observatory on Barbados. The collected data will contribute to a better understanding of cloud and precipitation processes and will help to reduce uncertainties in climate models. 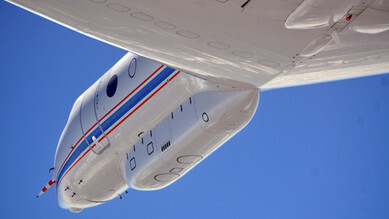 Remote sensing instruments, located in the "Belly Pod" underneath the aircraft´s hull, detected vertical profiles of temperature and humidity and the distribution of droplets and aerosols (Fig. 2). Additionally, so-called dropsondes have been released during the flight. These radiosondes usually ascend from Earth with the help of a weather balloon and perform measurements on their way through the atmosphere. This time, they were dropped by parachute and glided back to the ground. The first measurement flights were a joint project of the MPI-M with the Meteorological Institute of the University Hamburg, DLR, Universities of Cologne, Leipzig and Heidelberg and the Forschungszentrum Jülich. They took the scientists on a long-haul flight to Barbados, where the MPI-M cloud observatory is located, and back. During 70 flying hours comparison measurements with the satellite CloudSat have been performed during nearly every flight. The satellite measures the Atlantic clouds in trajectories crosswise to the flight route. Short flights of HALO in parallel with these satellite trajectories make it possible to verify the satellite´s measurements (Fig. 3): the aircraft flies at a lower altitude than the satellite and can therefore detect the clouds much more accurate. Fig. 3: Transatlantic air route from Oberpfaffenhofen to Barbados. Black lines: orbit of the satellite CloudSat. In total, the air route Oberpfaffenhofen - Barbados and back has been flown three times in December 2013 ("NARVAL South"). Additionally, local flights from Barbados eastward through the trade wind clouds have been operated. 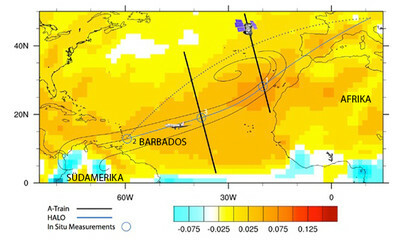 The aim was to detect clouds that are directly heading for the Barbados cloud observatory and to compare them to the land-based cloud observatory data. On 9th of January 2014, one month after the NARVAL flights through the trade wind clouds, the second part of the mission ( "NARVAL North") started under the direction of Prof. Felix Ament and Dr. Christian Klepp (both Center for Earth System Research and Sustainability/CEN, University of Hamburg). HALO was based on Iceland to examine the backsides of fronts over the North Atlantic. The amount of precipitation on the backsides of fronts is a controversial topic in science because satellite observations and model calculations provide different results. "Measured values are missing​​ because ships do not sail in these typical storm zones", says principal investigator Prof. Felix Ament. "A successful HALO mission could provide important facts and eliminate a 'blank spot' on the map of science." Fig. 4: AVHRR and Meteosat composite of the 3.9 micrometer channel at 10 UTC (left) and at 15 UTC (right) with overlaid flight path: the red cross indicates the position of HALO at the respective time with the elapsed flight pattern as a green line. Release points of all 11 dropsondes are depicted by yellow circles. The waypoints (left) indicate the ATC entry and exit point of the pattern box from waypoint 1 to 8 and SAT marks the collocation line flown for the Cloudsat underpass. The large cyclone over North America, which was centered in the North of Canada and led to record low temperatures in the US, was a good chance for the scientists to investigate the convection on it's cold back side after it has slowly moved to the Atlantic Ocean and the Labrador Sea. With its North-South extension, the cold front reached the southern tip of Greenland. The researchers examined the cold air masses coming from the continent which contained some large and a lot of small cellular convection structures. The first about nine hours lasting flight was operated through the cold air in a zigzag course. Parallel overflights by SSMIS satellites occurred, which are the basis for HOAPS. As in the NARVAL South mission, a parallel flight to CloudSat was operated on the flight back. A total of five flights was planned.